We decided to build this project because we all share a passion for food, and UCLA's dining hall is among the best in the country. However, there does not currently exist a convenient system for students to provide feedback. Therefore, in order to continuously improve the quality of food, we decided to create "What's Bruin?" to fill this missing functionality. Our project is called "What's Bruin? ", which contains both a web and mobile application. The purpose of this project is to provide a way to provide feedback on the UCLA dining halls. Users will be able to rate each dining halls and the individual dishes that each dining hall serves. 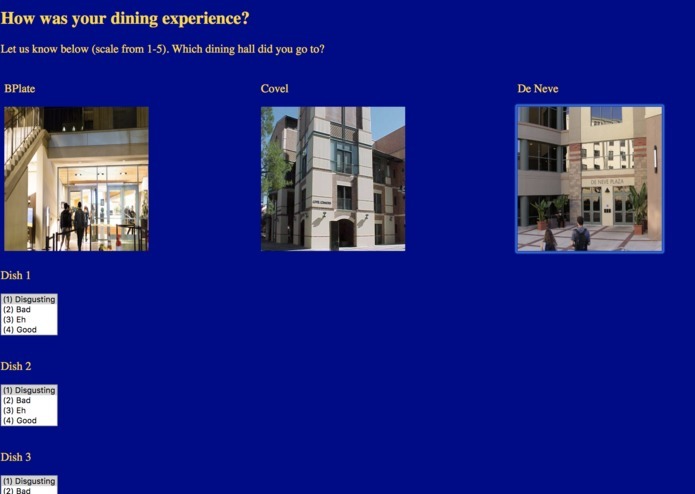 Additionally, similar to review sites such as Yelp, users will be able to gauge a general overview of each dining hall. We split this project into separate tasks. Zheyi Wang worked on the backend of the project, which involved using Firebase, pulling from the UCLA API, and communicating with the front-end. 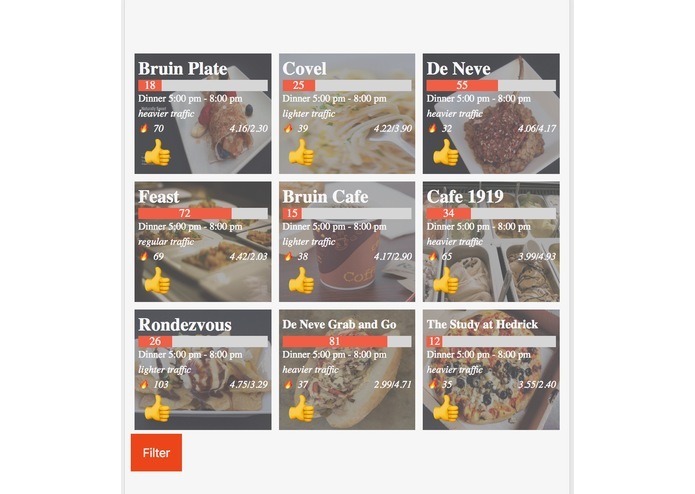 Yuanping Song worked on an iOS mobile application of “What’s Bruin?”, which provided functionality such as rating the dining hall food and visuals (such as being able to easily see the popularity and quality of the food at each dining hall and takeout place). Iyakem Estifanos and David Tung worked on the web application. This involved using HTML, CSS, and Vue in order to create a more interactive, connected, and visually appealing webpage. This webpage additionally contained the same functionality as that in the mobile app. We all started this project with little to no experience in both web and mobile development. Additionally, we had never used Firebase or Vue before. For some of us, it was also our first hackathon and experience collaborating in a group to create a full-stack project. We’re proud of what we were able to accomplish in half a day and how much knowledge we were able to gain. We would like to continue this project and finish fully connecting the front-end with the back-end. Additionally, we also plan to implement some type of machine learning into the app. We hope that the application will be able to learn the patterns of the users and suggest dining halls that they would like to go to, as well as communicate this to the Dining Hall Services of UCLA. According to Niche, Virginia Tech is now the #1 dining hall in the US, and we plan to change that.